I have never travelled completely by myself before and I’ve often wondered what it would be like. Would I be lonely? Would I be scared at night? I’m a bit of a chicken when it comes to being alone in the dark. Solitary walking for days on end, you find out things about yourself. 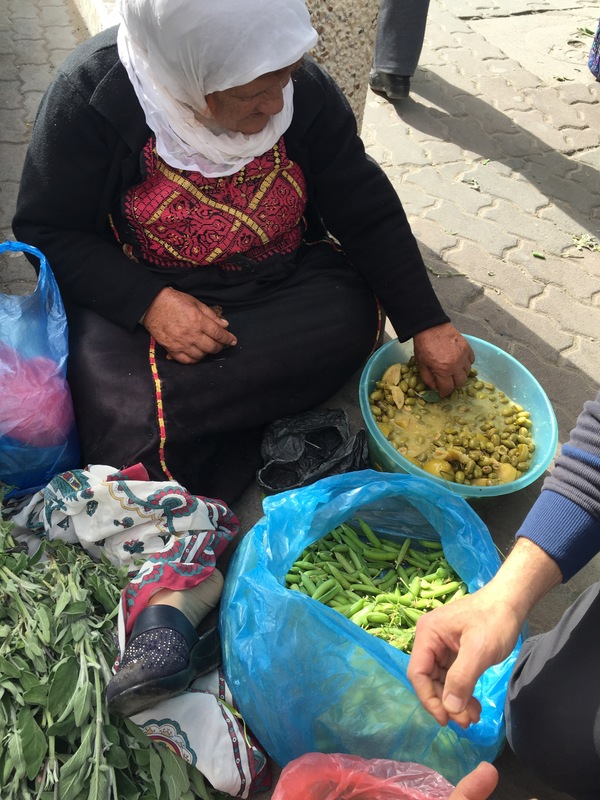 Life in Israel for me has been pared down to the bare necessities; food, water, shelter, and warmth. I have had the time and space, without the stresses of normal societal life, to just enjoy being. A boy that I saw on the trail, surrounded by his buddies, asked me if I was bored when he saw me walking alone. I was stunned – bored! I have wondered many things about travelling solo but not once did I consider the possibility of being bored. 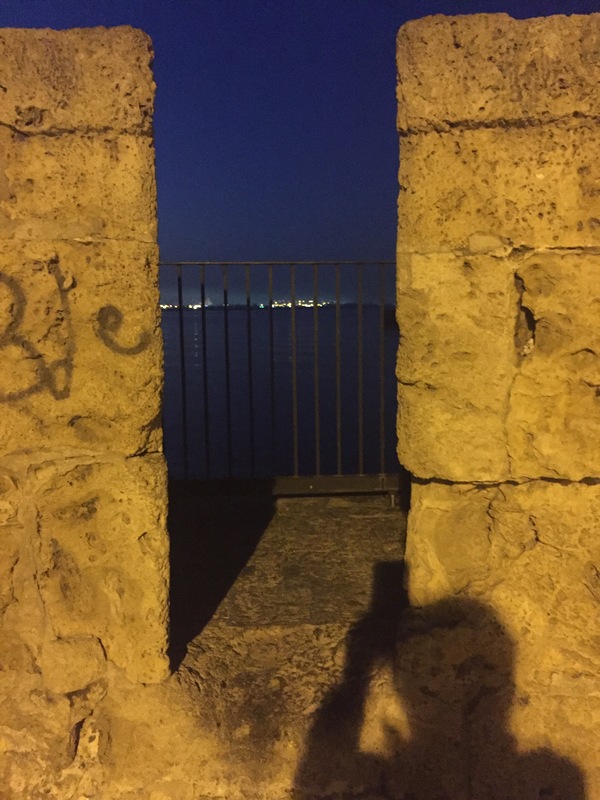 I looked at the scenery and historical sites through my own eyes, without distraction. For years, I looked at many things through my parents’, my kids’, or my husbands eyes. It may sound weird but on this trip I have remembered how to see through my own eyes. Often, I would choose a random person, imagine them wrapped in clothing of the past and I would conjure up an entire story about their life in the castle or tombs or wherever. When I was young my imagination was full of colour and texture and more than once I have mourned its loss. But the creative juices flow more freely here and it’s been fun playing with stories again. We all have a load to carry. Walking alone, the weight and onus of your emotional cross rests squarely on your own shoulders. You come face to face with the sticks and bones of your personality and the measure of your mettle. With the exception of the odd time when jackals (not coyotes as I previously thought) were howling at my tent door, I have not been afraid of the night, which was a surprise to me. Even shimmying out of my sleeping bag to pee, I greeted the darkness with detached steadiness. There have been times when I was lonely, and I have missed my family and friends enormously, but for the most part, I have been comfortable in my company, happy to wander at will, enjoying the freedom to indulge in my extreme frugal side. Fortunately, my super duper spidey senses have not led me astray. And if they have, the heavenly roll call who assigns only the most diligent to my detail have picked up the slack. Jen was a great travelling companion with her grit and her humour. Climbing mountains, bruising our butts sliding down dry waterfalls, quietly chatting in starlit desert nights by the fire are treasured memories. 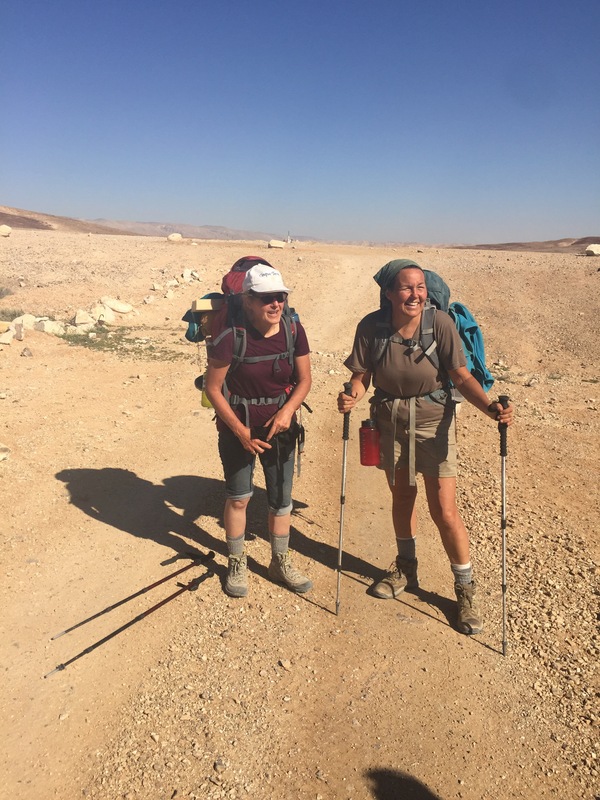 While we didn’t complete the entire Israel trail as planned our adventure was rich and full and I am grateful we had that opportunity. Her body is back in Edmonton but she has been with me in thought and spirit every step of the way. I have appreciated your emails and comments more than you can imagine. Hearing from you always made my day. Especially in my lonely moments when I felt very far from home, a few lines letting me know that you enjoyed reading the blog were like little bolts of joy for me. Being severely techno challenged, writing and sending the posts took far longer than I care to admit, but it was my way of sharing the adventure. So thank you for reading, and for hanging in with me. It’s been a treat. If I have any advice to impart, it is to trust your instincts, allow yourself time to do what you love, and always pee downwind. And maybe on the last night, don’t push your luck. Just take a hotel. See you on the flip side! I heard voices. I waited a moment for whoever was out there to go away, but they didn’t. It was definitely me that they were interested in. I was in my tent on the rocky hillside of Mount Scopus near Hebrew University in Jerusalem. It was about 10 pm and I had just settled into my sleeping bag for the night. I popped my head out of the tent and saw three police cars. The policemen shone lights in my eyes and were visibly relieved when they saw me. They said there had been a lot of trouble from the Palestinian town below and told me to pack my stuff, they would find me a better spot because it wasn’t safe where I was. The better spot they found me turned out to be a bed in the dorm of the university. Which was very cool. 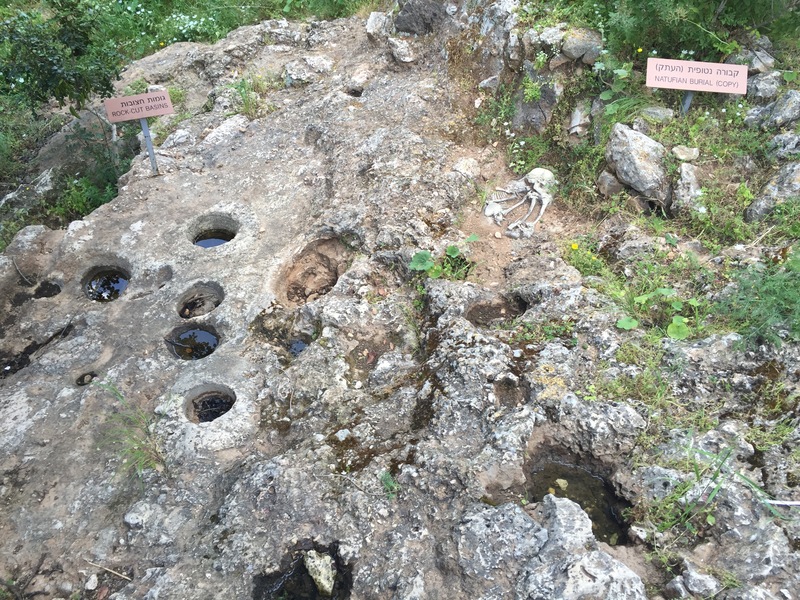 The next morning in the Botanical Gardens I saw the Stephen and Gail Victor Plaza (which had been a goal from the start) and ancient burial caves where the tombs and ossuaries of Nicanor of Alexandria and his family rested. 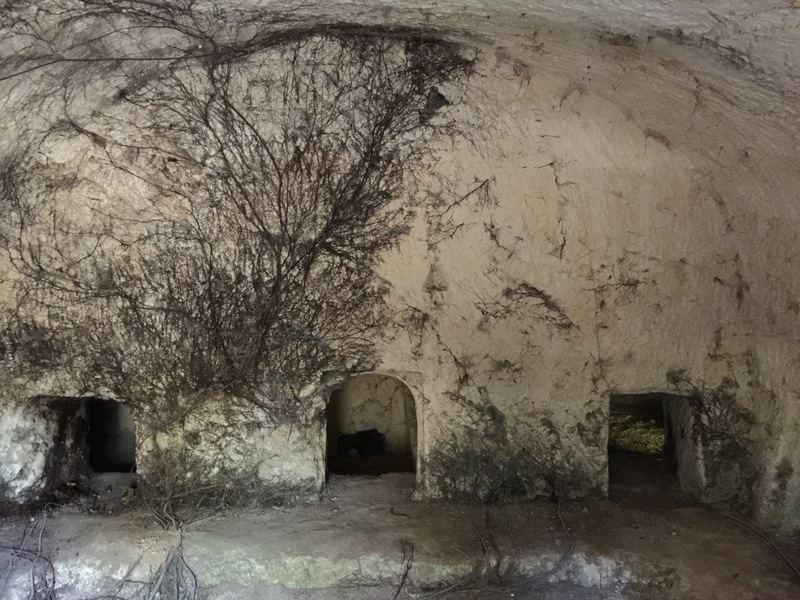 The roots of a fig tree, sensing the cool moist interior of the caves climbed up the inside of the limestone walls. I am astounded how nature finds its way. 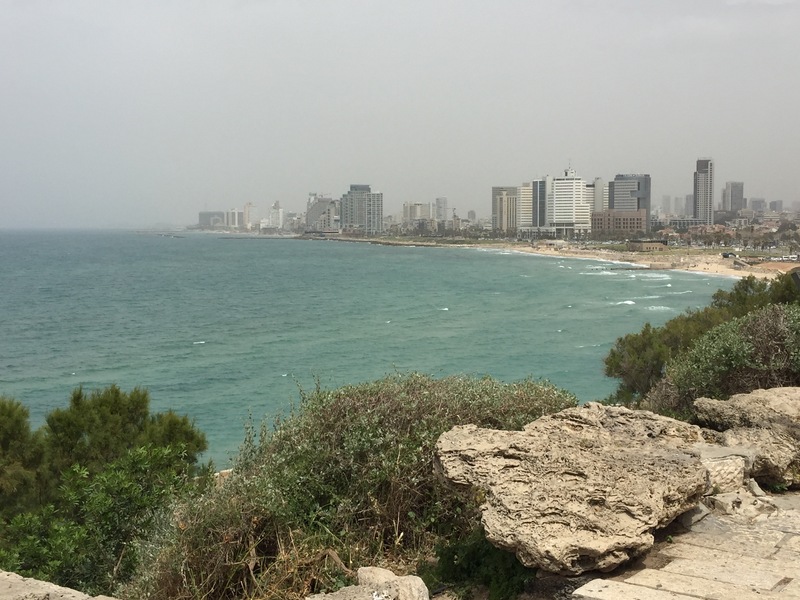 With only a couple of days left, I arrived at a beach in north Tel Aviv on Shabbat where nubile, lithe long haired beauties and swarthy men with rippling six packs roamed. I clomped through the sand with my hiking boots and back pack like I had just tumbled off the turnip truck. I settled myself in beside the cliff and watched the fit and beautiful twenty something crowd perform mating rituals as old as time. Techno music blasted, dogs of every size raced around like they were communally owned, the thwack, thwack of paddle balls echoed everywhere. Shabbat was over at sundown and the beach emptied as suddenly as a switch being flipped. I set up my tent in the gathering dusk, the grey sky blending with the calm sea and decided not to put on my fly. That evening, while writing in my journal, the sky lit up and I heard a loud boom followed by a reverberating rumble roll across the water. (For a nanosecond I thought it was a bomb.) The wind picked up and I realized that I was in for a rough night. I raced out to get my fly on and all my belongings in the safety of the tent. By now the sea was raging and the intensity of the thunder and lightening was unnerving. I got everything battened down just as the rain started. I couldn’t believe I was getting hammered by an electrical storm. When I emerged in the morning, my pegs were gone and my tent was wrapped around my head. I packed up and walked south to Jaffa under clear skies. Along the coast, I saw a gathering of people dispersing and a bunch of delicious food laid out on tables. When I realized that the servers were throwing out the food I almost had a coronary. I raced over, found the boss man and got permission to eat my fill. Yum! Turns out it was a company fun day. It was certainly my fun day! 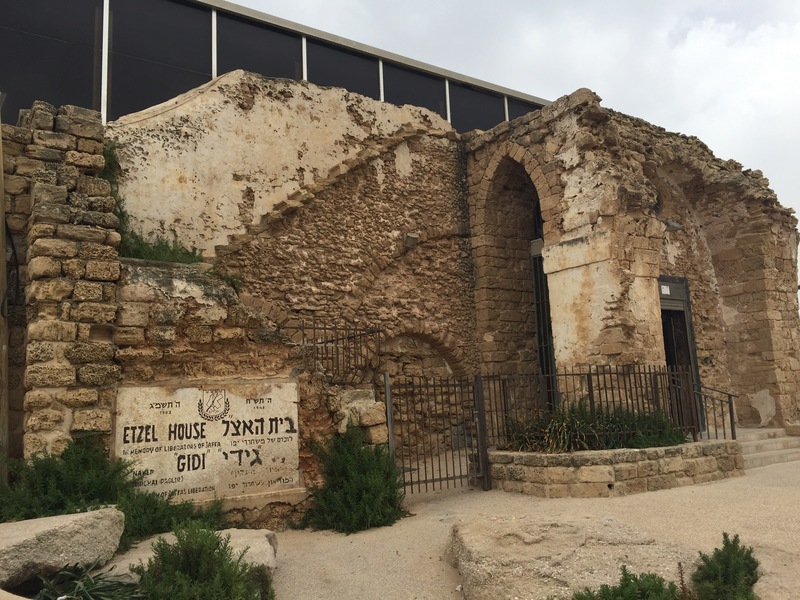 Jaffa has been destroyed and rebuilt several times in its 4500 years of habitation. St Peter lived there, Jonah left from there for his ill fated date with the whale, the Greek mythological tale of Andromeda and Perseus originated from Jaffa. (Andromeda’s mother boasted of her beauty, Poseidon took offence, sent a sea monster to devour them. Andromeda was stripped naked and chained to a rock to pacify the monster, Perseus heroically saved her). Jaffa and Tel Aviv are the meeting point of old and new. Tel Aviv is a democratic, vibrant, liberal city that is technologically advanced where, for every two citizens, there are three opinions. It is full of diversity and the contradictions and passions of modern Israel but I can’t do it justice. Cities are not my thing at the best of times but now I am just too weary. 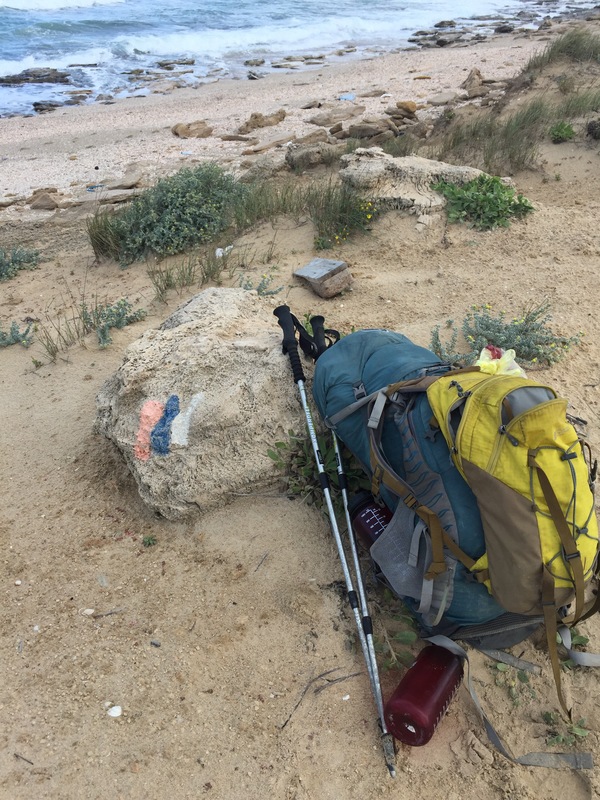 My mattress is leaky, my stove is broken, my stuff is sandy and wet, I’ve got 6 shekels to my name, my email has crashed (can’t send or receive) and I am ready to point my poles homeward. I slept in the far reaches of the employee parking lot of the Ben-Gurion airport under the stars in a soft green thicket for my final night. It was comfortable, out of the way and I slept well. It would have been perfect except for the dozens of red spots that now cover my face. I’m not sure what they are but I’m assuming hundreds of bugs feasted well last night. Before leaving for Israel I had visions of returning home lean and tough. Instead, I am wearing my long johns because my hiking pants are too tight, my ankles are toast, and my face is a sight. Ah well – it has been the Cadillac of adventures and I am savoring my final hours on Israeli soil in the comfort of the airport, swollen, itchy face and all. I returned to Jerusalem to the Church of the Holy Sepulture to bless the pebbles on the sacred stone. My pagan beliefs notwithstanding, there is definitely something extraordinary about that rock. Again, my head felt almost magnetized to it. I was where Christ died, now I would see where it started. 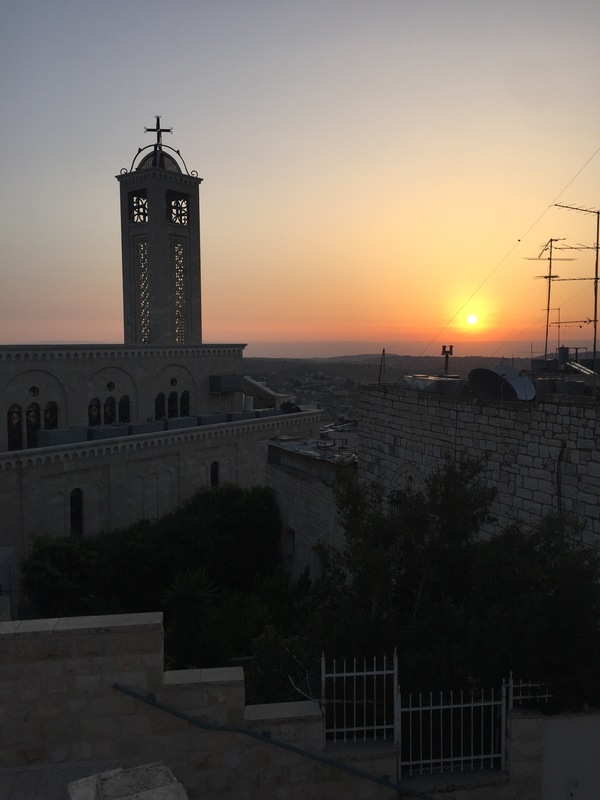 I got off the bus in Bethlehem, a little edgy to be in Palestinian occupied territory, and was immediately accosted by a dozen taxi drivers all wanting to relieve me of my shekels. But I knew the Church of the Nativity was only a half hour walk away, and politely waved them off without hesitating. When I got there the church was closed for the day. I wasn’t, however, going to leave without seeing it. I found the Catholic Melkite church with rooms to rent, but when I inquired, they said they were full. I offered to pay to pitch my tent in their gated courtyard but I was still turned away. It was getting late and I didn’t want to wander. I found a hiding place at the bottom of a long set of stairs, enclosed on both sides, leading to the locked gate of a school yard. It was a good secure spot and I slept well. It felt very cool to be in Bethlehem, the city of David, sleeping under the bright stars because there was no room at the Inn (so to speak). In any case, I enjoyed the poetic irony of it. The sunrise was amazing! The Church of the Nativity was built in 300 A.D. by Constantine, directly above the grotto where Jesus was born. It was destroyed by the Samaritans and built again by Justintine in 618 A.D.. When the Persians destroyed all the churches in 680 A.D. the Church of the Nativity was spared because, on the wall, they saw the mosaic of the three kings and one of them was wearing a Persian uniform. When the Muslims came and converted many churches to mosques, they left that church because they also believe that Jesus was a prophet, the last before Mohammed. 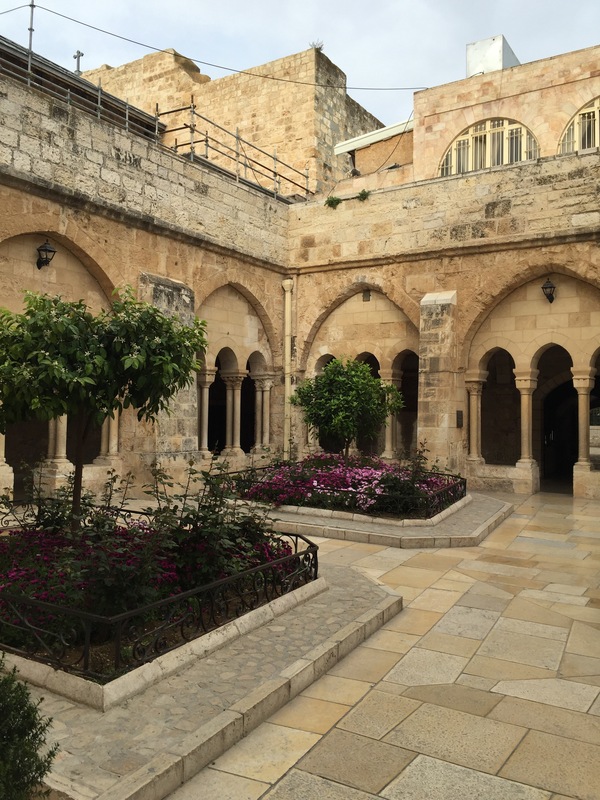 At 1500 years old, the Church of the Nativity is the oldest Justintine church, still in use, in the world. 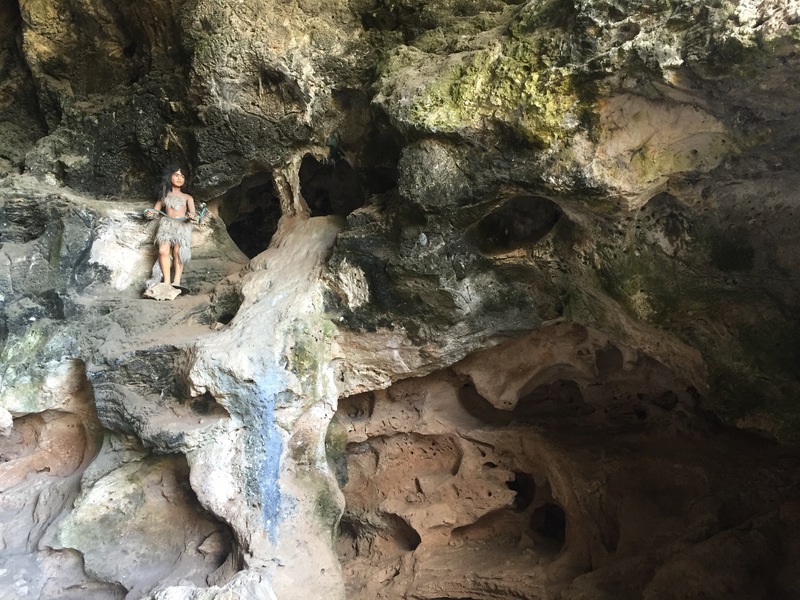 While waiting to enter the acclaimed cave, an Orthodox Ukrainian mother was agitated and gesturing wildly to me, pointing to my backpack, and touching her forehead like she was at a loss. I finally got the message – I wasn’t wearing a skirt, nor was my head covered. Trying to please, and not wanting the old girl to have a heart attack, I ran to my pack, dug out my scarf, wrapped it around my waist and placed my towel over my head (my handkerchief was too buried). With a big, genuine smile I presented myself to her – her look was priceless! It said so many things! …the crazy lady has finally clued in,… oh, what a disgrace,…but… she is obviously a little off but she is trying and I appreciate that,…and yes OK,…she’s wearing a skirt, sort of, and her head is covered, sort of,…I guess it will do. She then nodded at me and went on her way. Around the grotto of the nativity I saw other grotto’s. One held evidence of the tombs of many babies, believed to be the babies that King Herod ordered killed while searching for Jesus. Another was the tomb of St.Jerome, who spent 35 years living in the cave translating the Bible into Latin. 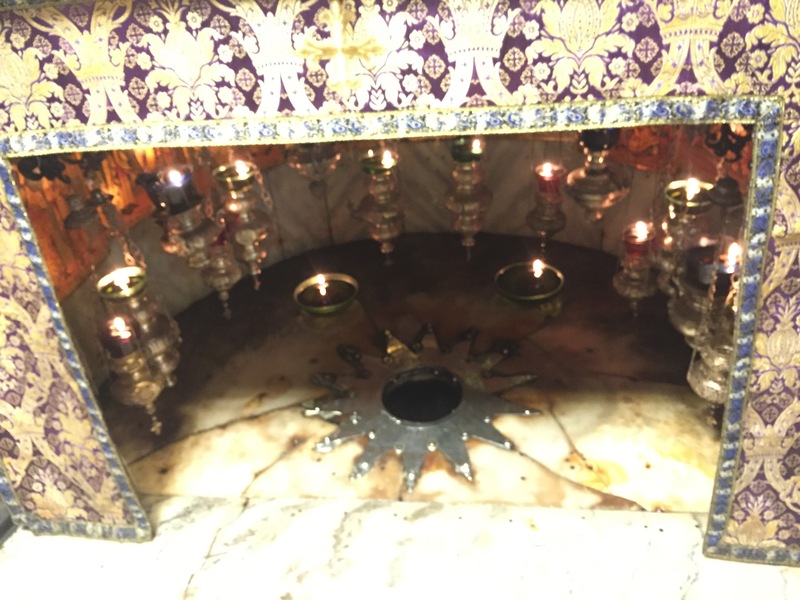 The grotto of Christ’s birthplace had a humble entrance and was marked by a small circle surrounded by a multi pointed star. Back on the streets nobody spoke English and very few people acknowledged me, except a group of fierce looking young men who all called ahhh-lalalalalalala behind me. I half expected to get hit in the back with a camel burger. Shortly after, I realized that every woman had her arms, legs, and head covered. My legs were already covered but I used my scarf to cover my head. After that, people were more friendly, some nodding approvingly, clearly appreciating the effort. Before leaving, I bought some lemon cured olives that were delicious. I found the bus and returned to Israel, or left Palestinian occupied territory, depending on your politics. At the checkpoint, the Israeli military boarded the bus to check for passports. In one of my more manic culling sessions I unwittingly threw out my visa. They didn’t like it but they didn’t know what to do with me. They asked me when I was leaving, hummed and hawed a little, and let it pass. I am happily back on the shvil, slowly working my way towards Tel Aviv, continuing with care. I will be unconnected for the next five days as my data plan has now expired. I will post again when I have access to Wi-Fi. Possibly at the airport on April 11th. Shalom. I left the Sea of Galilee the day after Easter Monday when I received notice from Kathy and Relly that my solar charger had arrived. Yippee! 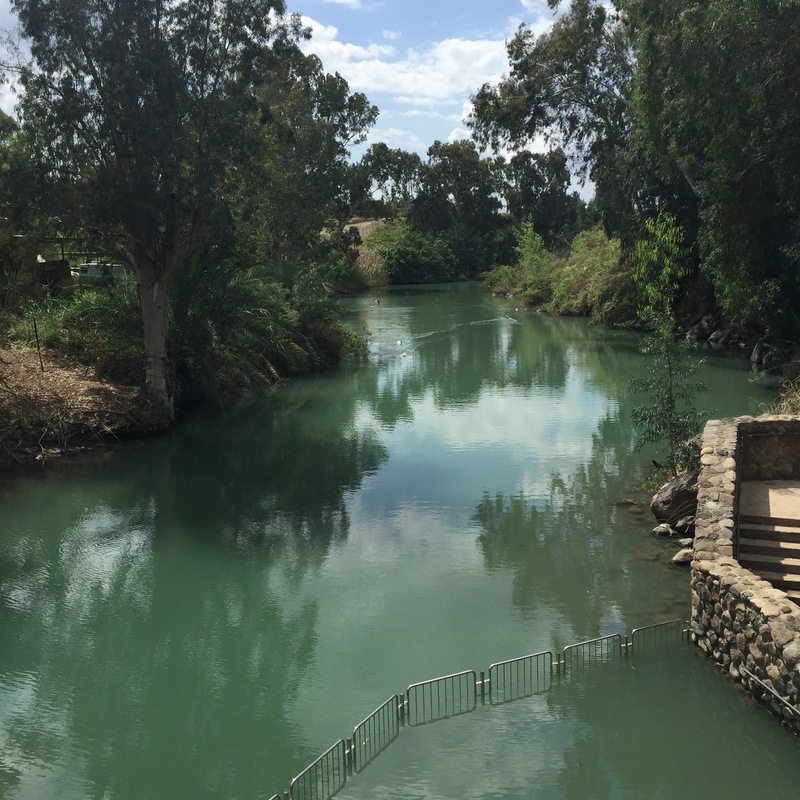 En route to collect it, I stumbled upon Yardenit, the site where Jesus was baptized by John in the Jordan River (the Hebrew name for Jordan is Yarden). It had a pastoral beauty to it, with stone benches along a walkway beside the flowing, pristine water of biblical times. Over half a million visitors flock to the site every year, many of them making a rededication of immersion, or to be baptized for the first time, but there were only a handful when I was there. 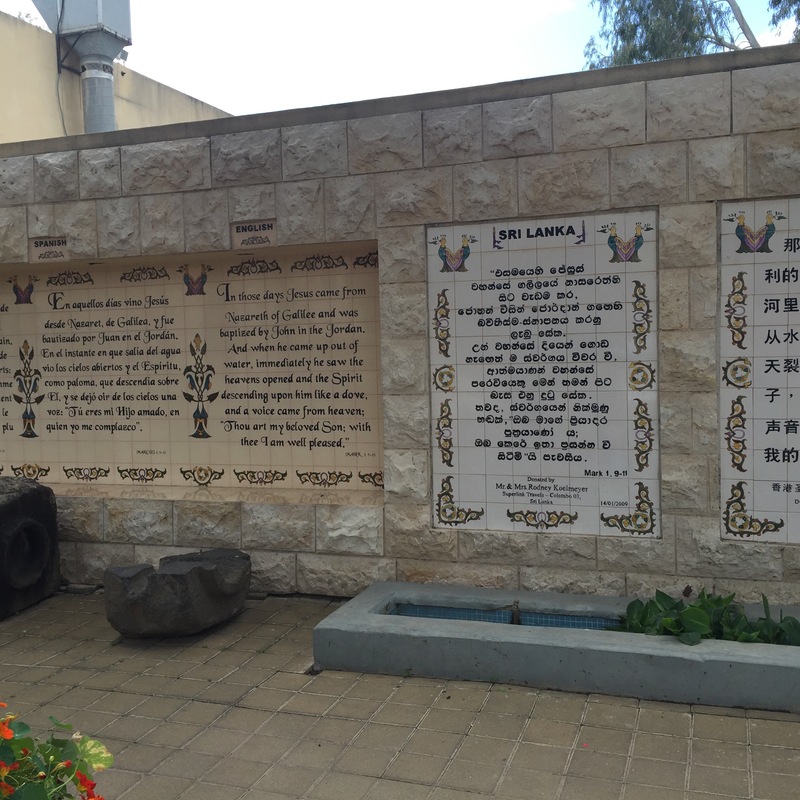 The verses of Mark 1: 9-11 were inscribed in a wall of stone in almost 100 different languages and dialects. So many places with such historical significance! It was peaceful and lovely and I was happy to have seen it. I caught a lift from a kindly old man who was headed in my direction. He could barely see over the dash, so just to be safe, he meandered down the centreline. All the while, chattering in Hebrew and gesticulating with arthritic looking hands to emphasize particular points. Occasionally, he would weave shakily back into his lane after angry honks. Finally, my nerves shot, I indicated that I was where I needed to be. He pulled over, I thanked him and got out. It was all I could do not to kiss the ground. He was very sweet and offered to drive me farther but a bucket full of skittles wouldn’t have lured me back into the car. Eventually, tired but sound, I was at the Penn’s and reunited with my solar panel. I went to the caves the next day. And the following morning, Kathy dropped me off in Haifa. Haifa is a sprawling modern city. 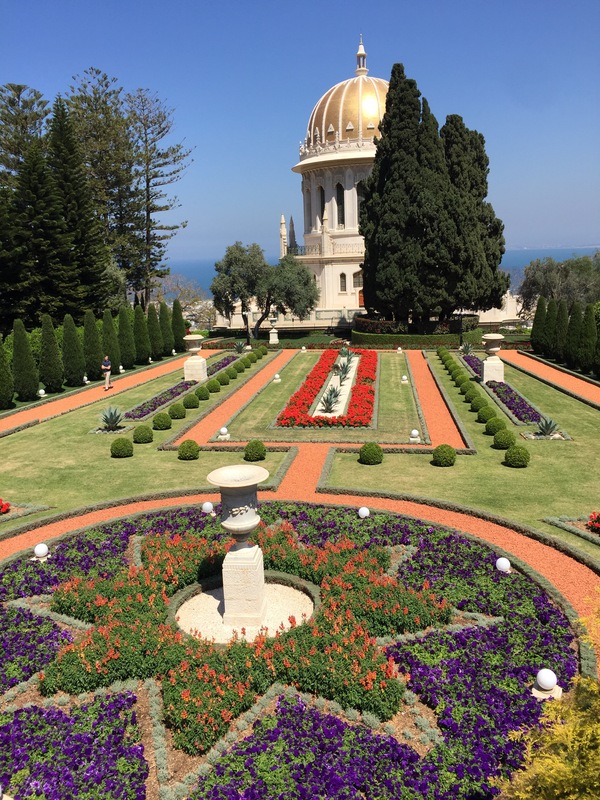 It took an hour on the bus to reach the Baha’i World Centre, and I realized when I arrived, with abject horror, that I didn’t have my hiking poles. I couldn’t believe it – I had left them at the first bus stop! Those two scarred poles have supported me through precipice and peril across the continents for years. Fighting tears, I immediately caught another bus back the way I had just come. An hour later, trusting I had the right spot, I hopped off the bus, eyes scanning, hoping against hope. And then I saw them. They were leaning against the bench, right where I had left them. Weak with relief, I clutched them to my bosom like they were the Holy Grail. I didn’t realize I was so attached. I entered the quiet, manicured gardens of the Baha’i World Centre. The meticulous attention to detail was astounding. Every ornament gleaming, every bush evenly trimmed, not a random stick or errant pedal to be found. 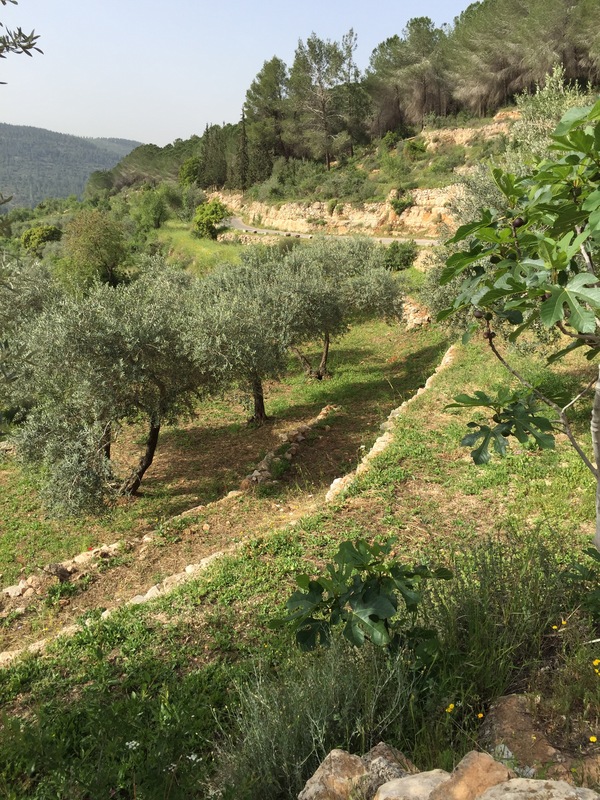 The planted terraces stretched a kilometre up the mountain. No ceremonies or religious services are held in the small holy shrine where their earliest prophet rests. There is no talking, chewing gum, wearing shoes, touching walls, or taking pictures. Nobody is watching, nothing is for sale and there is no charge. I entered the shrine and passed through brown velvet curtains into the small space of contemplation and prayer. I was greeted with the delicate smell of many roses, crystal chandeliers, wall to wall Persian carpets, candles, and wall tapestries. Again, I was alone, and an aura of deep peace pervaded. Leaving the gardens and getting out of Haifa was like being tossed out of Eden and into the lions den. It took me hours. I inadvertently ended up in the old city of Acco, another very cool ancient port, also visited by Alexander the Great. But the only thing on my mind was finding somewhere to lay my head. I ended up crawling into a small stone V-shaped shelf that was made for defence and guns within the old city wall. It butted right up to the sea and was right in the bustling mediaevalist town, but I believed I was well hidden. Then, when two Muslim girls stopped and asked to take a selfie with me, I realized that I wasn’t. I had no problem with the selfie (although not sure why they wanted me in it) but I was too tired to move or care otherwise. Unfortunately, I was still awake when the nasal Islamic prayers were broadcast (about 100 feet from my head) at 5 AM. I packed up my bag, and in the cool, dark morning, my trusty poles echoing on the ancient stones, I left town under the watchful eyes of street sweepers and stray cats. After a couple of hours walking, I took a train and got off at the first rural place I saw and hiked west to the sea. So here I am, on Atlit beach. In front of me is the Mediterranean, behind me is thorny scrub, on one side of me are the ruins of Atlit Castle (built by the Knights Templar in 1217 ) and now enclosed within a restricted military compound, and on the other side, a Crusader cemetery. I sleep in the shadow of the graves of over 1700 Knights, crusaders, and pilgrims buried here, and for the last couple of days I have rested in the warm sand contemplating nothing deeper than why ants can run almost as fast as me (or why I can’t run much faster then ants). It is very windy and a fine sand seasons everything I eat. Today I will continue south. That’s all I know. But like my son’s poster says, “Not all who wander are lost”. I look way up to the large black holes on the side of the cliff. My heart flutters. ‘The cliff’ is an ancient reef created 100 million years ago by the primordial Thetis Sea and is rich with the fossilized remains of extinct marine creatures. Within the cliff walls are a series of prehistoric caves with evidence of continuous human habitation for 500,000 years, a rarity in the world. But the most surprising, was the discovery of two physically different hominoid groups existing in the same location simultaneously. 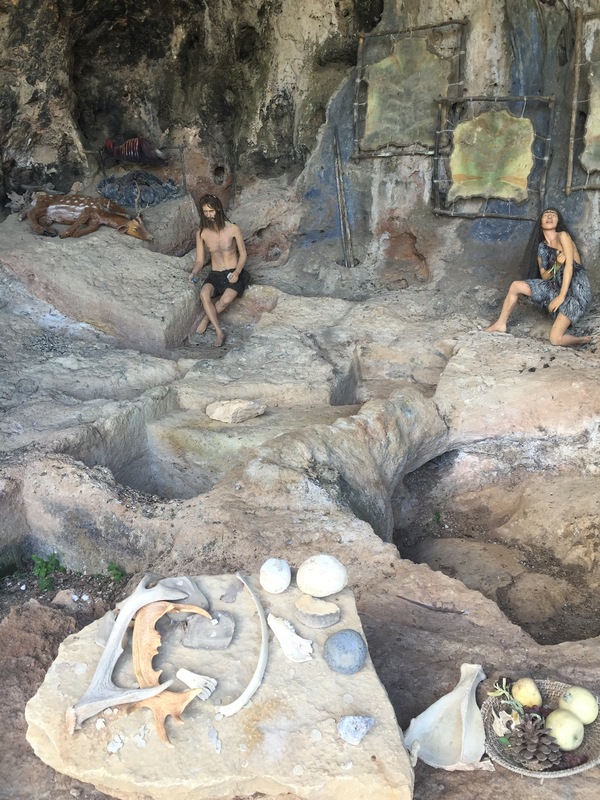 I am standing in the only known site in the world where skeletons from the Middle Paleolithic Period (250,000 – 50,000 years ago) of both Neanderthal and Homo Sapians (modern humans) have been found together. I start up the steep, winding steps in the ‘Nahal Me’arot Nature Reserve’ leading to the caves. My breath quickens with excitement. I think about what other secrets lie hidden within this cliff. When I reach the top, I look down and see buses far below with hordes of school children pouring out, but for now, I am alone. I enter the large cave of el Wad and pause to get a feel for it. What was it like to live here? The damp seeps in from the cold walls, occasional drips fall from the high blackened ceiling, in the dim light I see lines where water flowed through. Tens of thousands of years ago there was a lot more rain in this area and the shoreline of the sea was much closer. An abundance of water, plants and animals provided everything prehistoric people needed to survive. I slowly walk forward in the footsteps of their story. With similar facial and body features, I imagine them scraping hides and making tools. Three different cultures have lived here but the Natufian culture represents a transition in the way ancient humans lived. It was the beginning of extensive hunting and gathering which eventually led to the domestication of plants and animals and sedentary settlements. A variety of 10,000 to 15,000-year-old tools and artistic items were discovered here, as well as numerous burial sites with evidence of possible ritual and ceremony. I leave the caves and step into the sunlight of the present world. I hear the ruckus of children’s voices close by and I am happy that my walk through the past was solitary. I ponder the fate of the Neanderthals. What happened to them? Did we live side-by-side? I also ponder our fate. Will we go extinct? Will future races wonder how we went extinct? Who knows! In the end, we are one small link in a long chain of remarkable history.